In Mariah Carey's world, Thanksgiving is all in the family. The pop star jetted off to Honolulu to celebrate the annual American holiday with her children by her side. 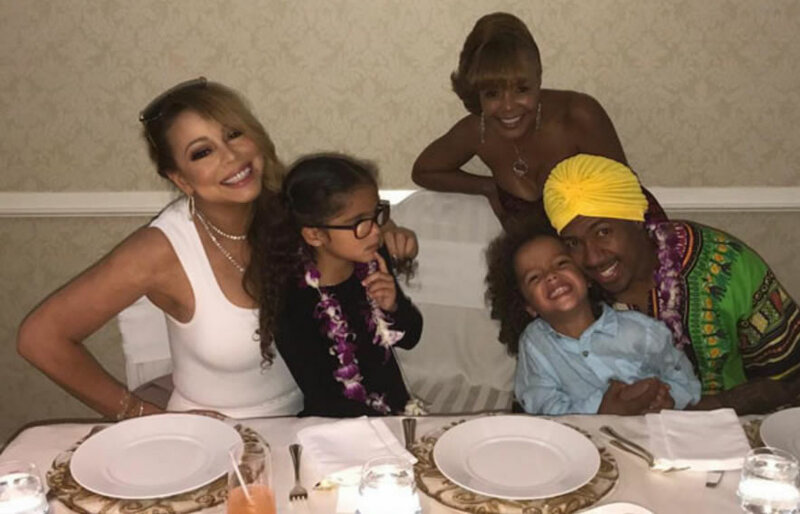 In photos shared to Instagram, the songstress posed with twins Moroccan and Monroe at the festive dinner table. "#happythanksgiving everyone," Carey captioned one of the shots on Instagram. Ex-husband Nick Cannon wasn't far away, grinning with son Moroccan sitting on his lap. The star chronicled her day preparing for the night's feast with photos of her decked in diamonds while picking up groceries at a local supermarket. So, what was on the menu at Carey's Thanksgiving? To start, plenty of Hawaiian punch and pies. As is typical fashion, the music icon couldn't run a few errands without drawing a bit of a crowd. "Just a regular day at the #grocery store in #hawaii #groceryshopping #itsperfectlynormal #happythanksgiving lambs," she wrote on Instagram. Cannon seemed equally happy for the quality time with his two tots as he shared a funny selfie with his twins and let his daughter play with Snapchat filters. "My [heart]," he wrote of the 5-year-old.